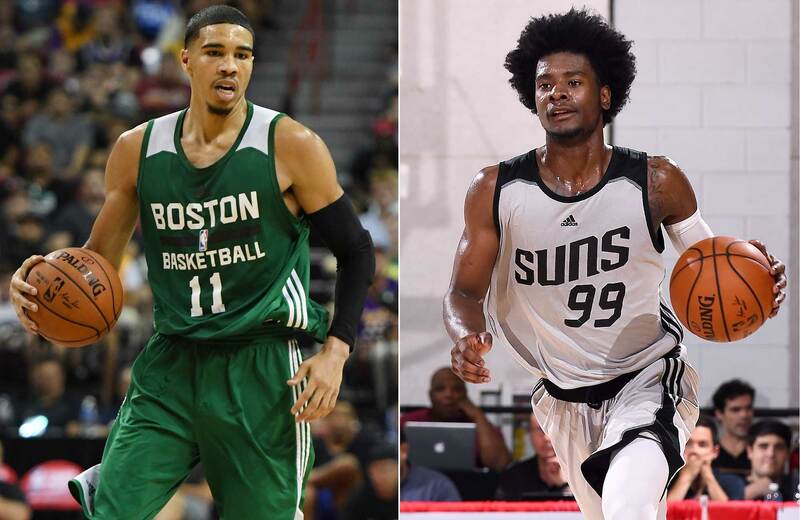 Which NBA rookies fared the best at Las Vegas Summer League? The Crossover examines the best and worst showings from lottery picks, sleepers and more. The dust has settled in Vegas, the Lakers are Summer League champions, training camp is still months away, and now we wait. Members of this year’s draft class have completed their first set of hurdles as professionals, and The Crossover was in the gym all week evaluating where prospects stood. It’s more prudent to break down strong showings than bash bad ones given the circumstances. Here’s how the rookies fared, and what to make of the hype for now. Love him or hate him (and for what it’s worth, I’d suggest the former), there was little denying Lonzo Ball’s prescient passing ability over the course of the past week. The Lakers were the most entertaining team in Vegas and fed off him all the way to the title game, which Ball sat out on a precautionary basis after an ankle injury. It seems clear that Ball will at the very least be a must-watch playmaker. He should also be an easy-to-watch one, given how happy the league must be to hand L.A. national airtime going forward. Ball’s full-court heaves and artistic flashes of ball movement are a unique brand of fun that were the only thing that had most people hanging on after a week in the desert. Ball has generated quite a buzz already, drawing throngs of Lakers fans to the Thomas & Mack Center and putting up the kind of outlandish numbers that have largely proven his father right. He was awarded the MVP on Monday after averaging 16.3 points, a league-leading 9.3 assists, 7.7 rebounds and 2.5 steals. Based on the sizable role he’ll play from day one and the undeniable "it" factor attached to his transition play, it’s fair to think Ball is the early favorite for Rookie of the Year honors. However, many viewed him with reasonable doubt going into the draft, which was also reinforced in Vegas if you paid close attention. Ball struggles to create for himself, infrequently takes advantage of ball screens, and most alarmingly shot just 10 for 42 from three (23%) in six Summer League games. The majority of his other points came in transition and on straight-line drives to his right. The first part is actually a great thing—the earlier in the clock you can get a good look, the more statistically efficient it tends to be—but the concerns about what happens when teams gameplan aggressively and bog down the pace are legitimate. The poor shooting is a small sample size, sure, but the thought that it could be tied to the predictability of his shot patterns and unorthodox mechanics is still concerning. With some perspective, Ball was about as good as we could have reasonably expected. 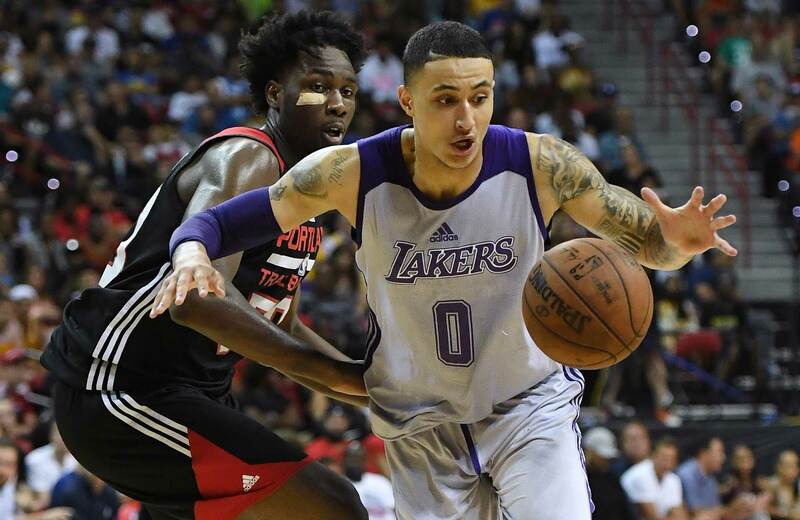 It was actually fellow first-rounder Kyle Kuzma who turned in the more revelatory showing, but he certainly benefited from playing off Ball most of the way. Lonzo’s game is well-rounded enough that we should certainly be excited—prolific, highlight-reel passers are few and far between—but expect bumps along the way, especially early on. If the Lakers are able to find him superstar help, the sky’s the limit. And hey, don’t forget Brandon Ingram looked great out here (albeit for one game). It was a good week on whole for the draft’s top prospects, and Jayson Tatum and Josh Jackson played to their strengths and in most regards. The third and fourth picks in the draft will probably be compared and contrasted for a while, and the good news is that both landed on teams that look like optimal fits. As we said on draft night, a lot of front offices made smart choices. Tatum played only three games in Vegas before being shut down, but also stood out in the Utah Summer League and in some ways outplayed Jaylen Brown (who also looked much-improved, if overly aggressive at times). There was some skepticism surrounding his versatility, but Tatum tried on defense and created matchup problems on the other end. Tatum’s ability to create looks and convert tough shots when space is limited is a skill in some ways better suited for a different decade, but still crucial in late-game situations. The Celtics should be able to help him become more ball-mover than ball-stopper. He shot only three times from three-point range but averaged nearly 18 points on 42% shooting. He’s good enough to force his way into the mix for a small place in Boston’s crowded rotation, but don’t get carried away yet. By the same token, Jackson’s performance was solid. He popped athletically, which should hopefully erase any fleeting concerns about him being nearly a year older than others in his draft class. He’s physically ready to handle some minutes as a versatile supporting player. Jackson averaged 17.4 points and 9.2 rebounds, making an impact on both ends and doing most things effectively beyond shooting the three. The Suns didn’t see major big steps forward from Marquese Chriss and Dragan Bender in Vegas, and it’s fair to think Jackson could become a bigger part of this team early on. Both Smith and Mitchell’s summer exploits have been pretty well-covered on this site, and both are sufficiently buzzing, looking like potential steals at Nos. 9 and 13, respectively. As has been a trend with this class, both players will enter the league in strong positions to succeed, Smith surrounded by veterans but still quite possibly the Mavs’ top athlete and shot-creator from day one, and Mitchell coming in on a young team that won’t need him to shoulder the offensive load yet. Smith fell to No. 9 largely based on how the lottery played out—he was unlikely to go top-five in a class this hyped. The Knicks at No. 8 are the team that will most likely be most scrutinized for their decision (after all, they’re the Knicks). Frank Ntilikina will feel a little pressure. Smith’s probably better off in Dallas anyway, given the more stable organizational structure and lack of unfair immediate expectations. The Mavs are working with Smith on his body language, and he’ll have time to evolve into a floor leader. Mitchell only played two games in Vegas but looked much closer to Smith and the other top guards than anyone would have guessed (he had a 37-point game and an eight-steal game). He’s not an efficient offensive player yet, but has shown every indication that he’ll be a contributor as a baseline thanks to elite athleticism and strong defensive instincts. Utah can use that much right away. The Blazers didn’t need a guard at No. 10, but the Hornets and Pistons both went that route. We’ll see what happens with Malik Monk and Luke Kennard. Is Kyle Kuzma For Real? Let’s take a second to credit Kuzma’s development and the Lakers for identifying his fit. The team sought players who would keep the ball moving and play off each other (with Ball in mind), and Kuzma has been that and more. The 27th pick out of Utah looked explosive and had his three-pointer falling all week. Scouts’ biggest question was whether or not he was actually a shooter, given the inconsistency of his college numbers. At this point, I’ve seen it enough that I’m buying the jumper. Kuzma shot 6 for 10 from three in the title game Monday (without Lonzo on the court) as part of a 30-point, 10-rebound performance. He runs the floor like a guard, he’s tough to stop with a head of steam, he understands how to play off teammates and he was competent on the other end. It looks like he’s a real part of the rebuild, with strengths similar to Larry Nance Jr., but a more perimeter-oriented game that fits perfectly when you play him alongside other passers—which appears to be the Lakers’ plan. For what awards are worth, he was a serious first-team snub in my book—and had ballots been submitted Monday, would have had an MVP case. Let’s not get ahead of ourselves…but still. It’s tough to truly bomb at Summer League. That said, it wasn’t all roses for everyone. Markelle Fultz sat out with an injury after one game. Bulls forward Lauri Markkanen (No. 7) shot just 29% in three games, but managed to average nine rebounds and block some shots. Zach Collins was shut down early with a thigh bruise but didn’t look ready for the environment whatsoever—to be fair, he wasn’t quite ready at Gonzaga either and really improved over the course of the year. De’Aaron Fox didn’t score a ton or make a ton of plays, either, and Kings teammate Justin Jackson shot just 23% from three in six games. These are things that happened, take it or leave it. I’m excited for Caleb Swanigan, who led the Blazers to the title game, averaged a double-double, and wowed scouts by showing up in amazing shape and reaping the benefits. At some point, hopefully soon, the weight issues are going to be erased from his narrative, because he might be the best rebounder in the draft and looks like a great pick at No. 26 (ahead of other solid summer perfomers like Kuzma, Tony Bradley, Jonah Bolden and Jordan Bell). Swanigan looks the more likely of Portland’s two first-rounders to sneak into a rotation that could really use his skill set. John Collins made the Summer League first team and was highly effective on the glass and around the rim. He benefited from not having to play much defense (which, to be fair, he wasn’t asked to do at Wake Forest either), but looked like a good find for Atlanta at No. 19 after slipping on draft night. Other bigs in that tier of the draft also did well for themselves, with Bam Adebayo reinforcing his value to the Heat as a readymade energy big and D.J. Wilson looking highly versatile as a future member of the Bucks’ rotation. Further down the draft, Dillon Brooks and Sindarius Thornwell looked good for the Grizzlies and Clippers. The bottom line is that many guys had strong first showings, and when you go up and down the list, this may be one of the better drafts in recent memory. The talent pool ran deep, teams drafted smart, and a lot of impressive players landed in situations that fit their skill sets. Let’s hope what happened in Vegas doesn’t just stay there.